If your workplace contains hazardous chemicals, having a written HazCom plan in place is essential for OSHA compliance and employee safety – but with so much information to cover, it can be difficult knowing where to start. To help simplify the process, we’ve created a customizable template containing the basic elements of a compliant plan, which you can easily edit to include information specific to your work environment. Save time researching and compiling a written plan from scratch – Our Written HazCom Plan template outlines OSHA’s required elements and general expectations for a compliant plan, such as details related to safety data sheets, container labels and employee training. Learn what's required for a compliant plan – Our template not only makes it easy to start the process of creating your plan, but it also provides helpful guidance and education about what customizations OSHA would expect for your specific work environment. Avoid costly fines for noncompliance – The HazCom Standard continues to rank #2 on the annual list of OSHA’s most frequently cited standards, and the Agency often cites employers for failing to have a plan or for having an inadequate plan. Our template makes it easier to ensure you have a comprehensive written plan that meets compliance requirements. 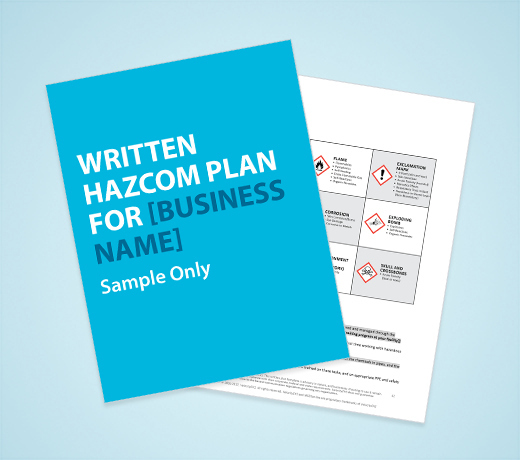 With our Written HazCom Plan Template, complying with this critical element of the HazCom Standard has never been easier. Download it, customize it and begin using it today!